Environment Ministers and high level officials from all over Europe, the Caucasus and Central Asia came to Maastricht in early July to make a renewed commitment to access to information, public participation and access to justice in environmental matters. At the 5th session of the Meeting of the Parties (MoP-5) to the Aarhus Convention (1) they came together to adopt the Maastricht Declaration, among other things to better protect whistle-blowers. The Aarhus Convention is a milestone in environmental democracy, granting procedural rights to the public with respect to access to environmental information held by public authorities. The Convention does not set standards for environmental quality in itself, but sets out rules for the public’s right to access to environmental information held by public authorities, to participate in bureaucratic procedures which affect the environment (e.g. granting a pollution licence to a power plant) and to gain increased access to procedural justice. Addressing the MoP during a high-level panel discussion, (European Environmental Bureau) EEB Secretary General Jeremy Wates drew attention to the link between Edward Snowden’s revelations of mass surveillance of citizens by certain governments and the Convention’s goal of greater public access to information held by public authorities: “While governments obtain more and more information about the activities of their citizens, the same governments continue to prevent citizens from having access to information held by public authorities. This is not the ‘information society’ we have been calling for.” The Maastricht Declaration responds to these concerns by making the need to better protect whistle-blowers like Snowden explicit. 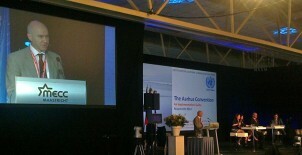 The meeting also welcomes Iceland, Ireland and Switzerland as new Parties joining the Aarhus Convention family. NGOs and many Parties are eager for a geographical expansion so many were satisfied to see that Mongolia also showed an interest to join. It was also encouraging to see country representatives, NGOs and scientists from Chile, the Caribbean, Morocco, Mexico, Japan and China present at the meeting. New members Ireland and Switzerland immediately ratified the GMO amendment to the Convention, which provides a mechanism for public participation in decision-making on the deliberate release into the environment and the use of GMOs. Of particular interest was the decision to name Armenia, Austria, Belarus, Bulgaria, Croatia, Czech Republic, Germany, Kazachstan, Romania, Spain, Turkmenistan, Ukraine, UK and the European Union as Parties that recently breached the legally binding rules of the Convention they signed and ratified. The reasons for not being in compliance with the Convention are different in each case and they can be found on this website. Activists and media can use this information to put pressure on any government that doesn’t respect the international laws it has signed up to. Here is a page with everything on the Aarhus Convention and the recent meeting – including press releases, statements, video interviews and a guide to the Aarhus Convention.